'Final Score' is an action movie directed by Scott Mann ('The Big Tournament') and starring Dave Bautista ('Blade Runner 2049', 'Avengers: Infinity War'). The film tells the story of Michael Knox (Bautista), an ex former soldier who has to use his military skills learned to save 35,000 people gathered in a huge sporting event. In this crowd stays the daughter of a comrade fallen in combat. The stadium will be hijacked by terrorists who will ask for a ransom for all the people who are in the stadium, putting the protagonist in the position of being a hero and saving them all. 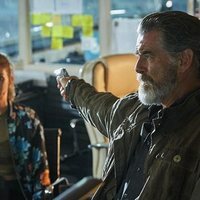 The film features in its cast with Dave Bautista, Pierce Brosnan ('Mamma Mia: Here We Go Again') and Ray Stevenson ('Transporter Legacy'), among others. Write your own 'Final Score' review. This is the second collaboration between director Scott Mann and Dave Bautista. The two stars, Dave Bautista and Pierce Brosnan, have worked in a Bond's film. Bautista in 'Spectre' and Brosnan in 'GoldenEye' and 'Die Another Day'. The movie has been filmed in Boleyn Ground stadium, so well know as Upton Park.